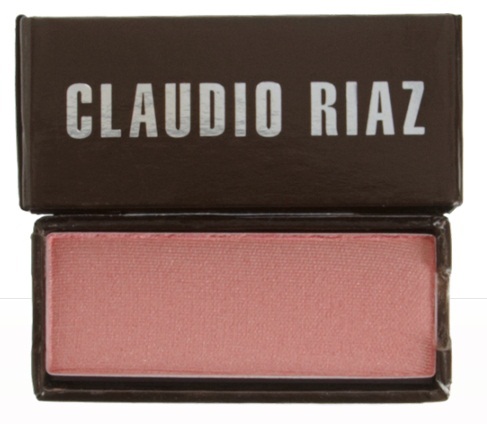 Claudio Riaz Instant Flush ($30) is a powder blush. It comes in one of those crazy-tiny cardboard containers. I choose to use them as-is. I don't want to spend more for extras. The Claudio Riaz makeup is drop-dead gorgeous, but you'd never know it from the Claudio Riaz Web site. I'm glad I had seen the items in person at Barneys New York. I knew what to order. If you saw the photo at the top of this feature, would you peg that color for the #2 product I've pictured directly above? I doubt it! The photo at the Claudio Riaz site is even worse. It looks orange. My photo of Instant Flush #2 was taken before the product was used. Odd that it appears "worn" a bit. That's the way I received it from the Claudio Riaz e-commerce site. I trust that it was new, and the "wear" was a manufacturing defect. Perhaps I did it trying to get the product out of its "shell." It's a tight fit. Instant Flush #2 is pink - a beautiful, bright pink. Need proof? Check out my swatch photos, which were taken in full, late-afternoon sun. I applied the blush in a heavy band at the top of my arm with a sponge tipped applicator. I used the same applicator to show a moderate application below. The color is much more subtle when applied with a fluffy brush. I think this pink is a stunner. It has a subtle shimmer and looks great on the cheeks - like a highlighting blush. I'm thrilled to have it. My only wish is that there were more of it in the container. I'm into Claudio Riaz makeup for the duration. It's going to be a long affair, and I'm totally committed to exploring the line. Claudio Riaz makes extraordinary makeup. Although Barneys has the best Web photos, they are frequently out of the most desirable shades. Claudio Riaz has a Web site. The photos aren't great, and it's hard to select colors there. They both make it hard to shop if you aren't familiar with the line. I am smitten with these products, except for their packaging. Most of the Claudio Riaz products come in a cardboard box. The box fits tightly into its "shell" and hard to get into. The open box slides out of the box shell, but not easily. Riaz intended that you purchase multiple products and put them into one of his Refillable Makeup Palettes ($28). I'm not really into "systems." I don't want (or have anywhere to keep) bulky planners, and big palettes fall into that category. If you'd like to know more about Claudio Riaz, check one of my early features here. Check out Gaia's Claudio Riaz features at The Non-Blonde. Distribution of his products is limited. You can find Claudio Riaz at Barneys New York and the Claudio Riaz Web site. While you may not get carried away shopping online, you will standing at the counter as soon as you can - trust me. I want so much more. Ha! i agree about the cardboard. I have several of his products, creme highlighters,eyeshadow, concealer. the box does seem to "give" a bit after use and there may be a lip inside that you want to make sure to open the same way each time. a lot of work but worth it. Had the pleasure of having Claudio himself do my makeup at the Barneys in Chicago. did not know it was him until halfway through. He is charming and quite fabulous. The SA tried to sell me the palette, but i told him i traveled and he said no you don't need it, he did not care, but she kept trying! YOu have to get the concealer brush, it is $$$ but the most wonderful brush i have ever used and had replaced the 7-8 other concealer brushes i have, it is better than LmdB. You lucky gal! I'd love to meet him. Yep, the reps at Barneys push those palettes too. Why? Think they make more money? I've heard about that brush. With your recommendation, I'll put it on my wish list. I agree; the swatches on Barney's site (actually, most beauty sites, with the exception of Ellis Faas, but their photos are downright disturbing) are ridiculous. I hate to mention the unmentionable, but what's the mark-up on cosmetics? It's pretty insane, no? If my facts are correct, it's one of the most profitable departments in any store, yet we get tiny, off-color pictures. Thank goodness for blogs like yours, but not all blogs have all colors, and when you find a new-to-you blogger, trying to figure out what colors look like in their swatches... Ergh! These photos are beyond the usual terrible. They are atrocious. Understood. The new Guerlains are special. I didn't love them. :) I bought four of six. Glad to see good swatches of his blushes. I recently purchased the Cladio Riaz double ended blush brush and it is the best blush brush I've ever used. You'll fall in love.